Our product range includes a wide range of frp cooling tower fan blade. Assisted by a qualified workforce and advanced manufacturing unit, we are engaged in offering a wide range of FRP Cooling Tower Blades. These tower blades are manufactured in our technologically advanced manufacturing unit under the visionary guidance of our professionals by making use of quality tested raw material and cutting-edge technology to accomplish the latest industry norms. Our offered blades ensure a low moment of inertia and are widely used in cooling towers of various industries. We offer these FRP Cooling Tower Blades in assorted specifications at industry leading prices. FRP blades are designed with the high-quality material to make a tuflite, sturdy and robust construction with state of art technology. Polymax coating provided to resist ultraviolet degradation and abrasion resistance facilitating better life with zero drops in efficiency for continuous operation. Fan blades are only a third the weight of most metal blades. Weight is concentrated around the center of a fan which reduces Motor, Gear drive bearings wear and tear and thus cust the maintenance cost. Airfoils blades virtually eliminate motor overloading due to aerodynamic design. Hub assembly is designed for minimum air cycling losses with cad system to reduce the hub size while improving the effective area for optimum uniform air delivery. 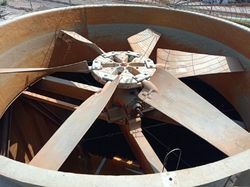 FRP fan is designed for operational reliability at an absolute minimum of downtime. The payback and the return on investment are guaranteed well within one year period.